SALT LAKE CITY (AP) — Luol Deng better be ready to run because Kyrie Irving thinks the Cleveland Cavaliers play best when they play fast. Irving shines in the open court and says the Cavaliers can win if they can run. They got out on the break Friday night, and Irving had 25 points and eight assists in a 113-102 victory over the Utah Jazz. "We were just feeding off of one another’s energy. We picked up our pace on both ends of the floor. 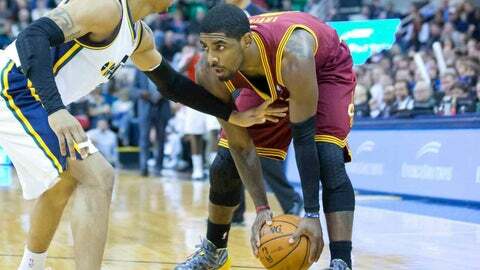 We got multiple stops and that led out to our fast-break points," Irving said. 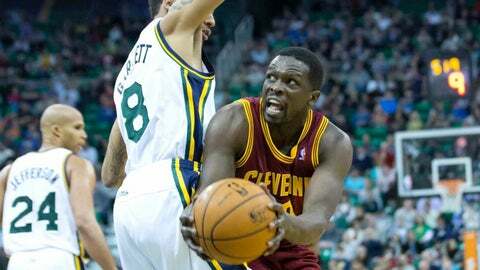 In Deng’s first game with the Cavaliers, Irving scored 17 points in the third quarter to turn a three-point deficit into a 15-point lead as Cleveland snapped Utah’s season-high four-game home winning streak. Deng had 10 points in his Cleveland debut. "He may have tried to press too much, but we want him to get in his rhythm with the rest of us," Irving said. The rest of the Cavs were certainly in a rhythm against Utah, one game after scoring 111 points against Philadelphia. The NBA’s worst-shooting team hit 54 percent against the Jazz, including 63 percent in the second half. "We kept preaching to our guys to push the pace, push the pace, push the pace," Cleveland coach Mike Brown said after his players set a season high with 39 third-quarter points. Tristan Thompson had 18 points and 15 rebounds, while C.J. Miles and Dion Waiters each scored 17 to help the Cavs win their first road game since a 109-100 victory in Orlando on Dec. 13. Playing without leading scorer Gordon Hayward, sidelined by a strained hip, the Jazz were paced by Richard Jefferson’s 18 points. Trey Burke had 17 points and six assists, but picked up his fourth foul in the third quarter right before Irving sparked Cleveland’s key surge. "I started being more aggressive and taking advantage of what they were giving me," said Irving, who missed three games with a bruised knee but has returned with extra energy and a sharp touch. Shooting 43 percent on the season, he was 6 of 9 in the win Tuesday against Philadelphia and then made all three of his 3-point attempts against the Jazz. After a root canal Thursday, Irving showed no ill effects as he scored from a variety of spots on the floor and pushed the Cavaliers to 21 fast-break points. "In the first half, I was just too slow. Playing fast not only helps me, it helps the team. Everybody was running the lane, everybody’s running for easy baskets and that’s what we need," Irving said. Deng played more than nine seasons with the Chicago Bulls and was an All-Star the past two before he was acquired Tuesday for Andrew Bynum and three future draft picks. Averaging 19 points and 6.9 rebounds in Chicago, Deng appeared to be searching to find his place in the Cleveland offense as he played only 21 minutes and had four turnovers. "It’s been so strange. Even coming in today and getting the jersey on and seeing it say `Cavaliers,’ it hit me again. But I looked in the mirror and checked the colors out and it looked pretty good," Deng said. Hayward, coming off a career-high 37 points, missed his first game this season because of a muscle strain in his left hip flexor. He will be a game-time decision Monday against Denver. This one was back and forth with 14 lead changes and 11 ties until Irving and the Cavaliers took charge in the third quarter. "He got his rhythm and he’s that kind of player. He decided to take it upon himself to pick it up there and we didn’t match his intensity," Utah coach Ty Corbin said. Trailing 49-46 at halftime, the Cavaliers started the third with a 10-2 run to take a 56-51 lead. When Burke was whistled for his fourth foul and headed to the bench, the Jazz were down 65-62. Irving took full advantage and scored 17 points, including consecutive 3-pointers, in the third quarter to spark another Cleveland run. Jarrett Jack, who has been bothered by back spasms, capped a 15-2 surge with a 3-pointer and a jumper to make it 87-70. "Obviously, Kyrie Irving got going. His team feeds off of him, and once he hit a couple of 3s and got to the line, that’s when they went on a run," Burke said. Miles, after scoring a season-high 34 points and setting a Cavaliers record for 3s in a game with 10, kept up his strong shooting by going 6 of 7. Miles played his first seven years in Utah and greeted Corbin with a warm embrace just before the opening tip. NOTES: The Cavaliers had lost six in a row at Utah before winning the last two. … After starting 1 of 6 from the field, Utah F Marvin Williams took off the face mask he’s been wearing since he broke his nose in November and played without it. … Anderson Varejao had two points and 14 rebounds for the Cavs, who outrebounded the Jazz 45-34.